What Will The Scale Say? First I have to say thanks to everyone for your concern regarding our plumbing issues. Interesting that the water technician from our borough was of much greater help than the dolt sent to us from the plumbing company. Ralph and I have decided it’s the last time for them! The town water tech however did a great deal to help and we think we’re all back on-line. Just have to address that washer filled with yesterday’s laundry. That’s my next project. I needed to pick up salad type things for the birthday party we’ll be attending tomorrow. Yes another birthday! We’re looking forward to it. I’ll be making a mega salad in a few minutes. Also had to stop at Walmart (logistically it was the closest) to pick up some dressings to take with the salad. Since I was there and since Walmart usually has the least expensive Morningstar Farms products in the area, I went foraging. Foraging is really the word because they had the boxes all every which way and it was difficult to find out which varieties were there. I even told the check out lady that they need to organize it. I’m really speaking up lately! I think I’m proud of myself! The mushroom lover’s burger!! I haven’t been able to find these for months, maybe even last year some time. Trust me these will be dinner tonight! 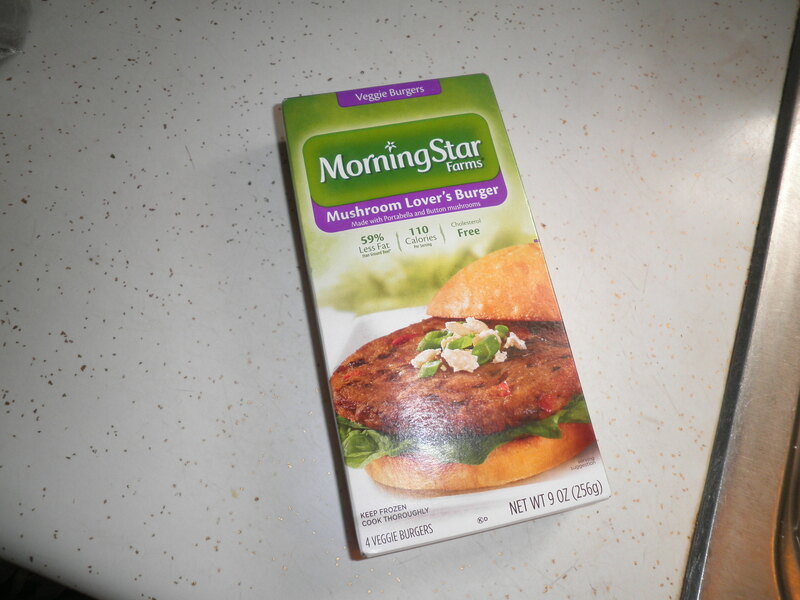 😉 I still say that I wish Morningstar would lower their prices on these, but soon, I hope to be making my own veggie burgers! Ummm…didn’t I say that last week?! No this time I’ll be doing it the Right Way!! I’m writing this on Friday afternoon and I’ll be scheduling it for Saturday morning. When it posts I’ll be at my Weight Watchers meeting. I’m hoping for the best and I certainly have felt as if I’ve been on track this week. Regardless of the result, I know that I’ve been mindful of my eating and making every effort to keep myself from getting out of control on anything. This entry was posted in Uncategorized and tagged veggie burgers, Weight Watchers. Bookmark the permalink. ok! good luck at ww, fran! i am just glad that you are optimistic going in because you know you worked hard to stay on track this week, and i think you had a really positive attitude. can’t beat that! our walmarts are quite messy, too, and that is one thing i really dislike about shopping there. i try to ignore the disorganization and focus on the great prices! very hard for a neat freak! love that you have yet another bday party to attend – have a wonderful time! Thanks, Cathy! Of course you know I WILL be documenting the party! Oh. I haven’t seen that variety (or the Asian burgers) for a long time! I’m envious! I tend to buy my Morningstar when they’re on sale at target! Thanks, Zo! Good day at WW!! I love the Asian burgers too. I see them at Walmart Once in a wile. The Walmart near me is horrible. I avoid it at all costs because the lines are so long and the store is so dirty. The ones across town are fine, though, and I go to them once in a while when I’m in the area. I’m with you on the heat, Dana. It’s nice here today, they say a high of 77. I can live with that and I think we’ll be out of the sun at the party. Good results, Val!! Thank goodness. Now to stay on track! Good luck with your weigh in Fran! I know I’ve said this countless times, but your positive outlook and attitude towards the ups and downs is totally inspiring! I love it! AND THOSE BURGERS! I am a very jealous girl right now! I am dying to grill up my own mushroom burgers. Hi Cara! I appreciate your support! I like the idea that we can support each other. These burgers are possibly my favorite from Morningstar and I can’t find them all the time. I should scurry over to Walmart and buy them out. Then they’ll think they’re very popular and stock them all the time. Well they are very popular…WITH ME!! Have a great day! !